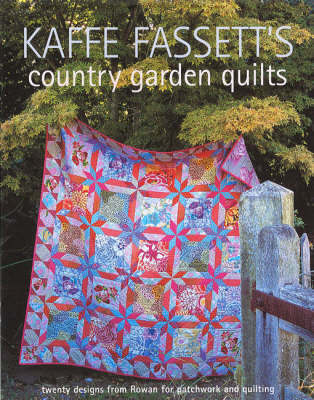 This title is the tenth in the series of Kaffe Fassett's highly successful patchwork and quilting books from Rowan, celebrating a decade of books from one of the foremost colourists of his time. It offers 20 new quilt designs, embracing a strong floral theme and using Kaffe's new fabrics. Photographed at Great Dixter, the 15th century manor house home of Christopher Lloyd, the well known pioneering gardener and writer, which showcases this glorious collection of new quilt designs from Kaffe and his chosen designers.Kaffe's new printed fabrics include lush florals, dramatic large scale designs and small-scale designs that quilters find particularly useful. Colours range from the rich and sumptuous to delicate pastels. New woven stripes from India come in rich earthy shades and are a welcome addition to the range. "Country Garden Quilts" is constructed rather like a cookery book with a sumptuous photo of the finished project, an ingredients list and written instructions illustrated with coloured diagrams, plus a 'flat shot' photo and all the templates needed.